A coaxial attenuator is an electronic device specifically designed to reduce the power of a signal without affecting or reducing the waveform of the signal significantly. An attenuator works exactly opposite of an amplifier which increases the power of the signal without altering the waveform. Amplifiers provide an increase (or gain) in the power output whereas an attenuator provides a loss of power (or a gain less than 1). 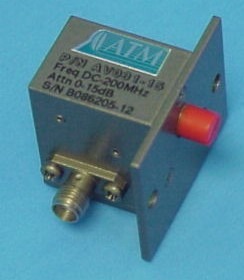 Fixed Attenuator - Where signal loss is constant and cannot be changed. Step Attenuator- Such as a Rotary Step Attenuator which has stops where the signal loss can be altered. Continuously Variable Attenuator - Also known as CVA, where the signal loss can be changed using a mechanical adjustment screw, knob or dial. 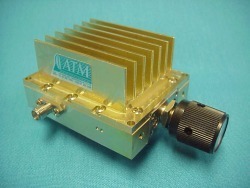 ATM carries a complete line of coaxial attenuators with 3 types of coaxial connectors: SMA, 2.9mm, or Type N.